After years of not bothering to have a TV, I discovered that there is a PBS station that can be picked up from the air in parts of Bellingham. Folks with a line of sight view to the top of Mount Constitution, on Orcas Island, should be able to get it. Much of Bellingham sees Orcas Island across the bay. We get the Bellingham area booster for KBTC out of Tacoma. It's in full digital HD on channel 28-1. KBTC also brings along WLD world news at 28-2 and TVW at 28.3. These sub channels are lower resolution, but still okay. WLD even rebroadcasts Al Jazeera News as parts of it's international news schedule. TVW is a C-Span channel for Washington State originating from Olympia. In the past, just about all the Bellingham TV antennas could get was Channel 12. Channel 12 and maybe a few Canadian stations. Well, now there's more. Channel 12 is still on and it also brings along something called "Cool TV" at 12-2; rock videos. Canadian channels abound also as I have a line of sight view to mountains north of Vancouver from my downtown Bellingham location. There's CBC, CTV and OMNI TV. Bellingham has a shopping channel and a Spanish station as well. My antenna works inside my apartment so the signal gets through the wood walls at least. I don't watch much TV, but having these choices made it worth while for me to go out and buy a 14 inch cinema style HD screen. Cost not much more than $100. My "old" TV is almost small enough to fit in a pocket. It's digital also since I purchased it in 2009. That screen is so small, I decided to upgrade. I remember when my parents bought their first color TV back in the mid 1960s. They said it was nearly $400; in 1964 dollars! Electronics is a real bargain in the modern world. Cable may not be such a bargain, but I just use my antenna. I still don't plan to watch that much TV, I'm not really a TV kind of guy. I'm more into radio. Making the antenna is part of the fun. I found directions on a web site for my first antenna. Made from coat hangers and chicken wire. It worked for a while, but came apart due to my lack of things like a soldering iron to weld it together. Next I bought a more professionally made antenna of similar design from Radio Shack; Only around $35. 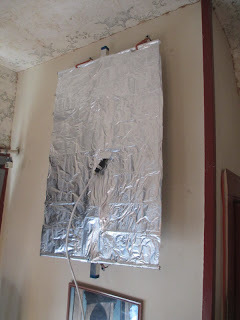 Then I made my own reflector with aluminum foil. 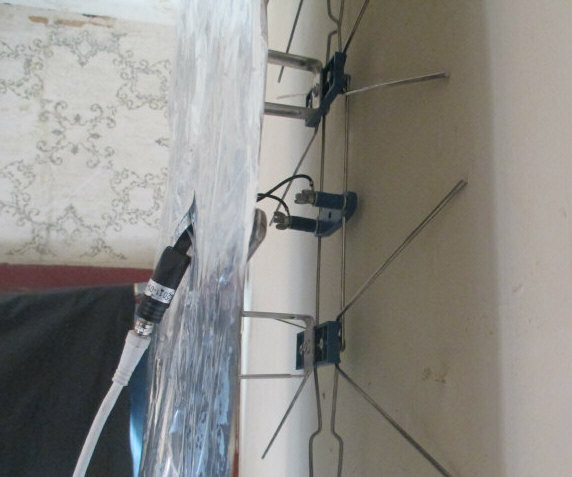 I taped the foil to the antenna and then laminated it with clear packaging tape so it wouldn't tear so easily. Home made aluminum foil reflector improves reception. It also looks better against my wall, in my opinion. Entire antenna is around 3 X 2 ft. Behind reflector is the guts of the antenna. Cross beam style elements like in my old antenna made from chicken wire, only this holds up better. The two connectors are hooked to a small 300 ohm to 75 ohm transformer which is available at electronics stores. Coaxial cable runs to my TV. I don't watch enough TV to justify cable. My internet comes from DSL over the phone line. Only around $54 per month broadband including telephone service. It is nice to at least have TV. 12 channels isn't bad. More than I remember, in the Bellingham of years ago. We're living in the digital age.